The eleventh annual Butler Group / JDSU Corporate Golf Day was a huge success again this year with some 40 customers coming together to support both the Butler Group and JDSU. 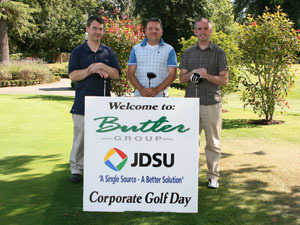 The Golf Day took place on Thursday 2nd September 2010 at the Hermitage Golf Club, Lucan, Co. Dublin. A total of 14 teams teed-off in a three-ball tournament, which was followed by dinner in the Hermitage. Both the Butler Group.ie and JDSU would sincerely like to thank all their customers who participated on the day and for their continued support.